Who’s Looking After Your Clouds? Cloud is the answer. It has to be doesn’t it? And its all about software, right? Wrong. I’m at VMworld in Copenhagen this week and its not just about software and its not all about virtual. Sean Regan walked around the show and found 14 hardware boxes that weigh more than him. Cloud? Maybe – clouds aren’t weighed down by steel boxes. Consolidation? Maybe. Some of its expansion, especially in storage, but shhh, don’t tell anyone; its a secret. From customers I’ve talked to here it seems to be all about doing more with existing hardware. Getting the cloud you want from the infrastructure you’ve got. That sounds like its a blend of physical and virtual, not just all about virtual. Symantec can take the hardware you’ve got today and help you build a cloud infrastructure on top of it in partnership with VMware. Once you’ve built that infrastructure, we’ll help you protect it too. Can you imagine deploying a physical production server without securing it or backing it up these days? You wouldn’t really would you? So why not extend the physical processes and technologies into virtual as you deploy it. Sure, its shiny and new, but that’s not to say the backup, security and availability of it needs to be totally different. How much time have you got to learn new processes and tecnolgoies and try to integrate them with what you’re already using and familiar with? If the answer is lots, then you’re in the minority! 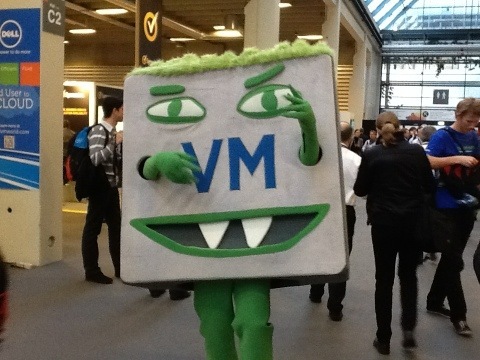 Here’s the other thing if you didn’t manage to get to VMworld this year. It’s funny but everyone is ‘number one for VMware backup.’ I know I’ve said it before in previous posts but Symantec really is – most market share, most customers, most customers backing up virtual environments with Backup Exec and NetBackup. Firstly, is your backup product VMware Ready? If a backup product isn’t certified by VMware that’s a problem. Why did VMware say no to certification? Secondly, why are you number one in VMware backup? Ask the question. Most of the responses we’ve had to the question this week at VMWorld have been along the lines of “the marketing guy told us to say that” which is interesting. What else has been of interest this week? Well outside of the obvious – customers want a better way of backing up VMware than file by file, machine by machine – the better way being the Agent for VMware that we’ve had in Backup Exec for over three years – high availability integration has also been on the agenda. ApplicationHA and it’s integration with Backup Exec and VMware was described to me as “something from the future” by one customer I spoke to today. The ability to look inside a VM and see whether the application has failed, rather than just monitoring the VM it is sitting on, and bring the application up on a second VM – interesting. The next bit more interesting though for Backup Exec customers is that if that failure occurs and the application can’t be failed over, Backup Exec can create a restore job and, optionally, automatically restore as well to bring the machine with the failed application back online. With a retail price of around $350 per VM that kind of functionality and integration seems to me to be something of a bargain. I’m not going to get started on security for VMware environments other than to say that Symantec is the largest security software company and when you look at new real estate in a virtual infrastructure the combination of market leading backup, security and availability from one company just makes sense. There’s a good reason it’s all market-leading software and all those reasons circulate around our customers who continue to buy and deploy that software. So who’s protecting your clouds? If you aren’t thinking about Symantec, you aren’t thinking . . .